The outline for this morning’s message is really simple. All you have to remember is 1, 2, 4. I am going to share with you one principle, two paths and four differences which show why one path is superior to the other. In the nineteenth century historical novel Quo Vadis, author Henryk Sienkiewicz describes an apochryphal meeting between the apostle Peter and the risen Jesus Christ. Peter is fleeing Rome and certain martyrdom there and outside of the city he encounters Jesus who going in the opposite direction towards Rome. 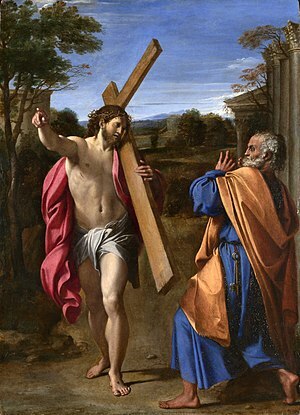 Peter calls out in Latin, “Quo vadis, domine?” which means “Where are you going, Lord?” Jesus replies, “If thou desert my people, I am going to Rome to be crucified a second time.” Peter realized that the path that he was on was not going in the direction that he should go, so he turned around and went back to Rome where he would soon be crucified upside down. Quo vadis? Where are you going? It is a question that each of us should ask of ourselves on a regular basis. One of the main things that Andy Stanley teaches is something called the Principle of the Path. The Principle of the Path is simply this: direction—not intentions—determines your destination. Let me say that again. Direction—not intentions—determines your destination. You can have all the good intentions in the world, but if you get on Highway # 1 and head east, you will not get to Vancouver. In the same way, you may be looking forward to enjoying retirement, but if you are not able to manage your personal finances and save for your retirement, you are not going to end up where you intend to be. When you get married, you probably intend on having a mutually enjoyable marriage relationship, but if you continue in your self-centred and selfish ways, you are going to end up alone in the future instead of growing old with your spouse. Perhaps you are in high school and have dreams of becoming a future Silicon Valley millionaire, but your work habits are such that you can’t get your homework assignments done on time. The direction of the path that you are on is not going to take you where you want to go. So what is your direction? And where will that direction lead? Note that the speaker in Henley’s poem values personal autonomy above all else. And even though there may be a long list of punishments awaiting him after death, he will not be afraid because he is the master of his own fate and the captain of his soul. Does this sound like a good idea to you? Even if you are an agnostic and you estimate that there is even a alight possibility of there being a God that exists who will one day call all people to account for how they lived their life on this earth, do you really want to continue on a path that could end with you standing before God and saying, “Well I now realize that my life choices are going to result in me suffering conscious torment for all of eternity, but at least I did it my way!”? Does that sound like a good plan to you? Even in this life, the “My Way” path does not lead to maturation or growth. Whenever the individual bumps up against reality and experiences the pain of falling short in some way, there is a tendency to minimize sin. “I’m not a bad person,” they may say to themselves and they can usually think of someone who does worse things than they do. At other times when they bump up against reality they will justify themselves. For example, when Ariel Castro was recently convicted of kidnapping and sexually and physically abusing three women for over a decade in Cleveland, he said at his sentencing hearing, “People are trying to paint me as a monster and I’m not a monster… I’m sick.” You and I do the same thing when we blame someone else for our bad behaviour. In addition to this atheistic version of the “My Way” path there is also a religious version. The religious person on the “My Way” believes that she needs to accomplish her salvation by pleasing God. If she does enough of the right things, she thinks, God will give her what she wants: more money, fulfilling relationships, success. The person on the religious version of the “My Way” path may appear to be pious and righteous according to outward appearances. But on the inside, there is no peace and no joy. The demand for more and better good deeds is endless and she serves grudgingly out of obligation, instead of joyfully out of love. When she bumps up against the reality of falling short, she tries to overcome sin. If only I do better, she thinks, my sin will not be an issue. Because she has not fully understood the bad news in her life, when she hears the Good News of the Gospel that Jesus has suffered and died on the cross for the sins of the whole world, she fails to understand how the Gospel is good news. To her it is another reminder of her sin, so she doubles her efforts. In effect, she is trying to earn Jesus’ forgiveness. On this path, the person misses God because she was not aiming at God. She didn’t really want God. She only wanted to have his personal desires met. She wasn’t really serving God. She was only serving herself, and she was using God in the process. Neither the religious nor the atheistic version of the “I’ll Do It My Way” path will lead you to God. This is what Proverbs 14:12 is describing as it says, “There is a way that seems right to a man, but its end is the way to death” (Proverbs 14:12 ESV). But there is a path where God is both the way and the destination. In Proverbs 3:5-6, we read, “Trust in the Lord with all your heart and lean not on your own understanding; in all your ways submit to him, and he will make your paths straight” (Proverbs 3:5-6 NIV). We could call this the “God’s Way” path, or as the early Christians did, we could call it The Way. The path of God’s Way is different from the “My Way” path in three very important ways. First, it is God that puts us on the path by claiming us as his child and giving us the gift of faith. If you want to look to a specific time when that happened, you can look to your own Baptism, when God worked through the combination of ordinary water and his Word to wash you clean of all your sins, connect you to Jesus both in his death and resurrection and give you the gift of the Holy Spirit, just as God did just a few minutes ago with little A. Second, the cycle of life on God’s Way is different from the cycles of both versions of the “My Way” path. Just like everyone else in the world, people on God’s Way are confronted with the reality that each day they fall short by saying, thinking and doing bad things that we should not do and by not saying, thinking and doing good things that we should. Instead of trying to minimize or overcome sin, people on God’s Way confess their sin. They freely admit their sin to God and to others. They realized that pride and self-righteousness will also have to be recognized, confessed and abandoned because these two things get in the way of us admitting our sin. Through the Gospel message, people on God’s Way are confronted with a new reality: Jesus and His Suffering & Death on the Cross for them. They joyfully receive Jesus’ free and full forgiveness. They relish his infinite and unconditional love. They celebrate their new and secure status as beloved children of God and co-heirs with Christ. Third, you end up at the best destination with God’s Way. God’s Way results in maturation and growth. Only God’s Way helps you to grow to be more like Jesus. Only Jesus Christ, true God who has come in human flesh, who lives a perfect human life for all people, who suffered and died for the sins of the whole world, who rose from the dead to declare victory over sin, death and the devil, who now rules over all of creation at the right hand of God, who will come again to set all things right in this world, who will raise us from the dead so that we can gaze upon his face and live with him in the new heaven and earth forever, only Jesus is the Way that leads you to becoming the person that he created and redeemed you to be. Jesus is the way of truth that leads to life, the rich, full, abundant life that comes through living life with God. And that way, that truth and that life is freely available to all through Jesus. Fourth, the God’s Way Path is a path of grace much like that of an infant child with her parents. Little A. did not choose to be born into a family with two loving parents and two big brothers and a big sister to protect her. She did not overcome some shortcomings in her life in order that she might be unconditionally loved and accepted by her mom and dad. She did not earn her new status as a beloved child of B. and J. and a co-heir with her siblings of all the good things that their mom and dad want to shower down upon them. As A. journeys through life, she will have her parents with her to provide for her and protect her as best they can. They will guide and direct her in age-appropriate ways. They will encourage and support her throughout her life. Wherever she goes and whatever she does, they will always love her. Though the relationship will change over time, they will always be her dad and mom and she will always be their daughter. However, as much as they love their daughter, J. and B. will not be the way for A., nor will they be her destination. Jesus is. As she remembers her Baptism, that is, as she lives in a daily cycle of confession and forgiveness, A. will be walking in both love and truth. The truth now lives in A. and will be with her forever. As much as A.’s parents love her, you have a Saviour who loves you infinitely more. For God so loved the world that he gave his one and only Son so that whoever believes in him shall not perish but have eternal life. Jesus washes you clean of all your sins and brings you into the family of God through Holy Baptism. Jesus gives you his body and blood in the bread and the wine of Holy Communion to nourish you with his forgiveness, strengthen you in faith and comfort you with his presence with and in you. As you live in a daily cycle of confession and forgiveness, you too will be walking in both truth and love. With Jesus, the truth will also be in you and live with you forever. Jesus is the way and the truth and the life. So I ask each one of you to think about this question, “Quo vadis, my friends? Where are you going?” Amen. “Ariel Castro: ‘I’m not a monster, I’m sick’ cbc.ca (posted: August 1, 2013. Web. http://www.cbc.ca/news/world/story/2013/08/01/ariel-castro-sentencing-hearing.html; accessed Aug 18, 2013).